Reviewing, critiquing, and advising on the world of wine auctions. While the Cru Bourgeois from Margaux Chateau Monbrison has the lowest estimate in the auction, working out to a seemingly reasonable ₤16.67 a bottle, this isn’t really such a great deal. The 2005 Monbrison is fairly widely available according to Wine-Searcher.com and can be found for only slightly more money on a per bottle basis. For example, two stores in Belgium and France price the wine at about ₤21 per bottle and stores in the States have it for around ₤23 ($35). Plus, if you live outside of England, you won’t have to hassle with Sotheby’s no-shipping policy if you buy retail, and no retail purchaser has to pay their buyer’s premium. Instead of the Monbrison, and if I was willing to drop a bit of dough, I might look at Lots 19 and 20 of the 2001 Chateau La Conseillante. It ain’t cheap at an estimate of ₤650 per lot ($1,000), but considering that it is considered a “very admirable” wine by experts, subdued but high praise from the Wine Doctor Chris Kissack (he rated it 17.5+/20), and that you’d be lucky to find it for less than ₤60 per bottle ($100), if you could get it for around the maximum estimate, you’d still be paying less than retail even when you figured in the buyer’s premium. If Port isn’t really your thing, perhaps you’d consider something lighter, like a 1er Cru Chablis? There are several lots of Louis Michel & Fils Montmains Chablis Premier Cru from the 2004 and 2006 vintages (nos. 372-374, 402-403) listed at maximum estimates of ₤160 ($240) for a case of 12, and there are two additional lots of 24 bottles each of the ’06 (nos. 404-405) at the equivalent estimate of ₤320 ($480). While Michel’s Montmains is far from the best Chablis, it comes from a well regarded domaine and International Wine Cellar (“IWC”) rated the ’04 Montmains 85-87 when it was tasted in the barrel. If you could any of these lots for under ₤200, you’d be saving money on retail. Per usual, it’s the big name Bordeaux from heralded vintages that will go for the biggest bucks. 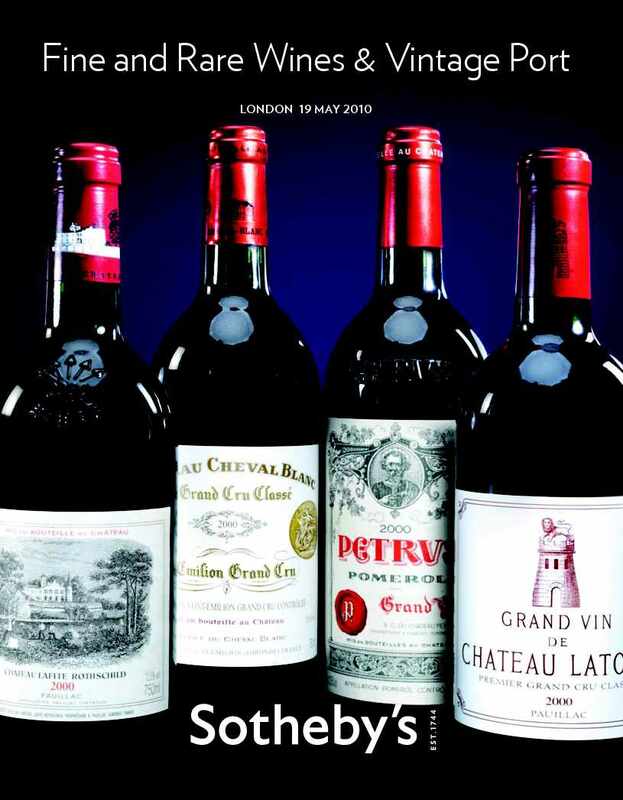 There are five lots in this auction that are estimated to sell for over ₤10,000, two cases of Latour (both from 1982), two cases of Pétrus (from 2000 and 2005), and the most expensive estimated lot, the Lafite 2000 that is listed above. On a per bottle basis, the Pétrus lots, nos. 9 and 57, are the dearest since they consist of six bottles per lot instead of the twelve bottles per lot of the First Growths. As mentioned earlier, all of these lots’ vintages – 1982, 2000, and 2005 – are considered to be top Bordeaux years by experts like Parker. Interesting, two lots of 1985 Le Pin (Lots 91 and 92, with 12 bottles and 6 magnums respectively) are in the rarified air as well with estimates at ₤9,000 each. Sotheby’s in-house Master of Wine, Serena Sutcliffe, effuses about this Le Pin, saying “This seems to me as essence-like as ever. Luscious blackberries, total appeal.” These Le Pin lots are the only ones in this auction that could be categorized as so-called Bordeaux “garage wines” or “microchateau” of the type that have been priced so highly in the past 20 years. Le Pin is usually considered a predecessor to the garagistes, the Bordeaux winemakers who eschewed traditional Bordelais subtlety for big, brash, tannic, fruity wines in the mid-1990s. Despite a substantial decline in “garage wine” prices, Le Pin has held its value better than most. Considering how tough Le Pin is to get a hold of and how expensive the wine is even if you can find it (one American retailer sells a case of 1985 Le Pin for $21,599.88, that’s approximately ₤14,560 at prevailing rates), these lots may even be a relative bargain. Relatively speaking. One other unsurprising, but interesting, note, out of the 40 lots with the highest estimates, there are only three that are not red Bordeaux: two lots (nos. 129-130) of 1985 Sassicaia Tenuta San Guido, called the “king of the Super-Tuscans” by Sutcliffe, and one lot (no. 121) of the queen of Burgundy, that’s me talking not Sutcliffe, DRC – Domaine de la Romanee Conti, from 2005. As both of the Sassicaia lots and the DRC one will likely cost more than a used car, you can imagine what the top Bordeaux sells for. Anyone who’s ever looked at the Liv-ex indices knows that red Bordeaux rules the roost when it comes to wine investing, and this Sotheby’s auction demonstrates that same thing. Luckily for those of us not named Buffett or Gates, the laser-like focus on a few “name” wines by investors leaves lots of lesser-regarded ones for us plebs to drink. Is Acker Merrall’s Hong Kong Auction on May 29th Selling Fake Wines? June 23, Chicago: Chicago Wine Co.
July 28, Chicago: Chicago Wine Co.
August 25, Chicago: Chicago Wine Co.
All rights reserved, except as stated below. The right to use excerpts of reasonable length with attribution is explicitly consented to. Copyright © 2010, Josh Friedman.